New York Governor David Paterson today announced that he would accelerate the pardon process so as to grant more pardons to legal immigrants convicted of old, minor crimes and prevent them from being deported. In other good news, Sheriff Joe Arpaio won't run for Governor. Now if he'd only leave law enforcement. David Newert at Crooks and Liars has more on Arapio's possible motives. And here's the Pulitzer winning five part Tribune series on Arpaio's performance in office, which leaves much to be desired, to say the least. Sheriff Joe Arpaio, who is the subject of three investigations for civil rights violations resulting from his policies involving the pursuit undocumented immigrants, is complaining the investigations are politically motivated. In his letter, [Arapaio attorney] Driscoll said that a civil rights probe of the Arpaio operation began in early March, weeks after four influential Democrats on the House Judiciary Committee called for an investigation into alleged discrimination and possible constitutional violations in arrests and in police searches and seizures. The investigation appeared on a list of accomplishments the Justice Department prepared for reporters in April, after the Obama administration had been in office 100 days. Attorney General Eric H. Holder Jr. has said that reinvigorating the enforcement of civil rights laws is a high priority. 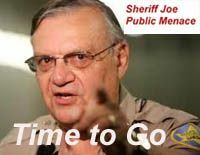 Sheriff Joe Arapaio is a national disgrace. Among the Pulitzer prizes awarded today was one to Ryan Gabrielson and Paul Giblin of the East Valley Tribune (Mesa, Arizona) for its coverage of Arpaio's immigration enforcement policies. Arpaio makes a mockery of the Constitution. Here's the five part series that won the Pulitzer. TalkLeft's posts on Sheriff Joe over the years are assembled here. Maricopa County (Phoenix, AZ) Sheriff Joe Arpaio, who instituted such ridiculous shaming punishments as forcing male inmates to wear pink underwear, making juveniles serve on chain gangs and bury the dead, and requiring inmates to sleep in tents, and who is the subject of a class action suit by the ACLU for racial profiling of latinos in an effort to enforce federal immigration laws, is being given his own tv show on the Fox Reality Channel. Women inmates in Maricopa County have been on chain gangs since 1996. Now, 15 of them will wear T-shirts that say "I was a drug addict" as they clean trash from a Phoenix street on Monday. What's wrong with shaming punishments? Everything. Here's Jonathan Turley in a terrific op-ed on the subject. There are other alternative sentencing solutions out there that should be tried, and if they are lacking, then judges should spend their creative energy coming up with better ones that don't demean and further alienate the offender.